The first Thursday of every month is Night Out in Cooper-Young. That means restaurants and stores have special prices and offerings, and bands are playing everywhere. The night gives artists, especially new ones, the chance to play and promote themselves and on Oct. 4, new artist Tori Tollison played for the first time in Cooper-Young at the gazebo. For three hours Thursday, Tollison rocked at the gazebo --- all by herself. You can hear Tollison's performance at the Cooper-Young gazebo here. Tollison started playing guitar when she was 8 years old. For 10 years now she has played professionally in bars, mostly on Beale Street. 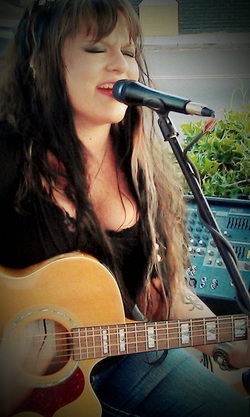 Most of the songs Tollison plays are covers of rock, pop, country, blues and alternative bands. Before Tollison started playing she took out a glass of honey. She always drinks a few sips of that to coat her vocal cords, she said. At Night Out, Tollison mostly played covers as well as a song she wrote. The single, “Bed You Made,” is about cheating in a relationship and will be released at the end of October. Tollison's plans are clear: She wants to play concerts and collect money to record an album. Besides that she wants to get her Associate of Arts degree from Northwest Mississippi Community College.